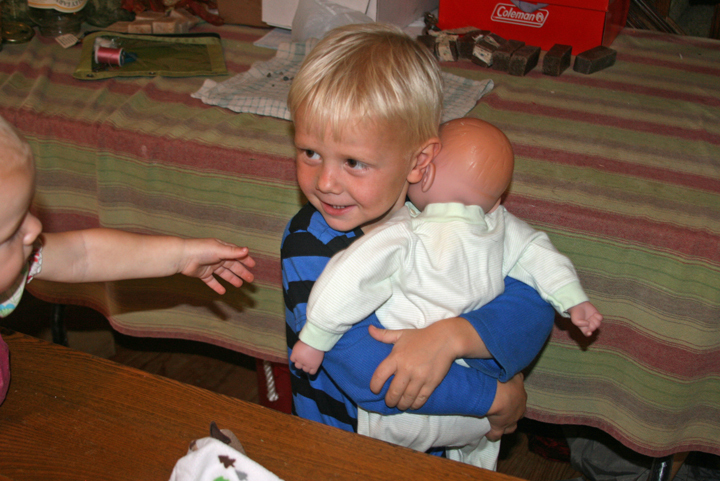 Sewing | life with three boys and a splash of purple! In the tie dye world there are facebook pages exploding with amazing collections of people’s best dye projects in 2017. Here are my top 17 dye projects for 2017. 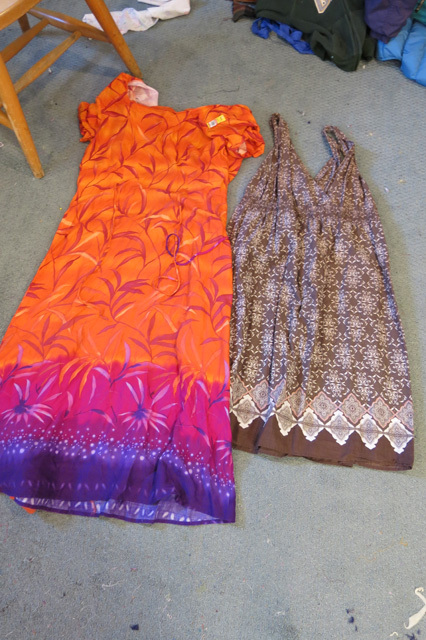 I spent the last week sewing and dyeing till I was sick of both. After this was done I left the sewing room for a few days. At the same time I got another request from a friend who wanted a dyed ring sling. 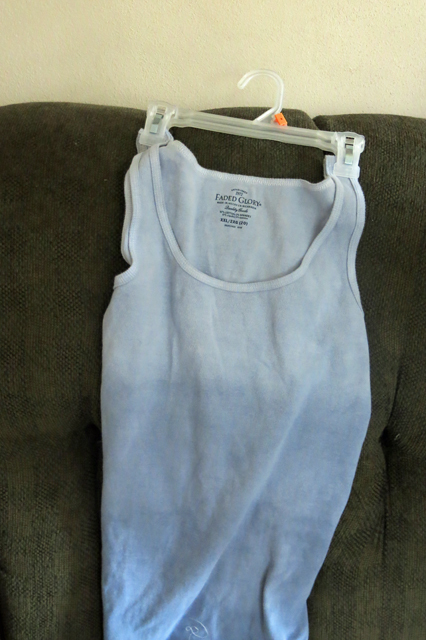 While I waited for our plans to finalize I went a head and over dyed a flopped dyed project from this winter. 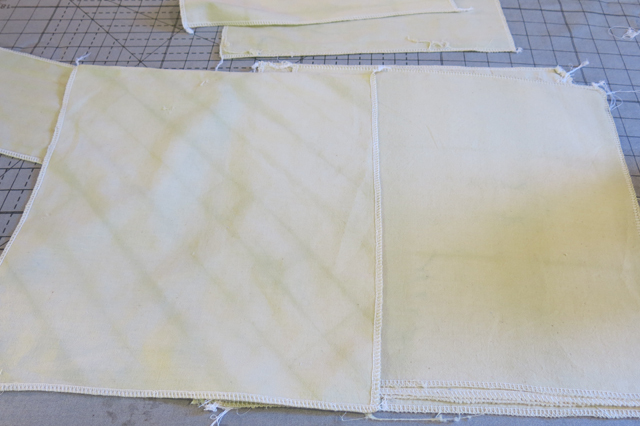 This was muslin 12 x 12 inch squares, dyed using a Shibori technique, with Dylon Dye Dark Green. I have no idea what I did wrong. The patterns hardly showed up and the fabric was a very light shade of green. 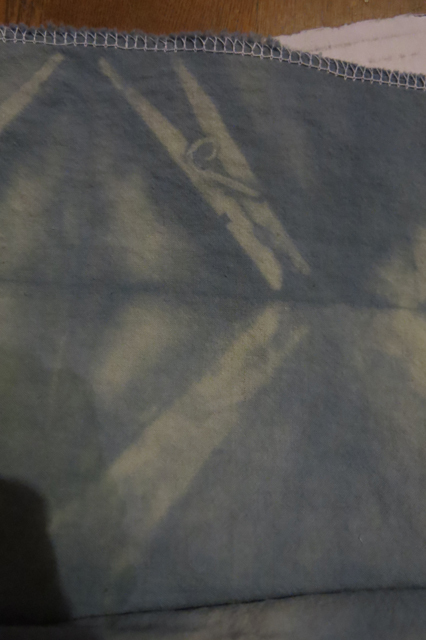 With both these projects with blue dye and many rinses later, left me swearing I would never dye anything blue again. I shouldn’t even say that because it was kind of fun and the blue is so pretty in real person! 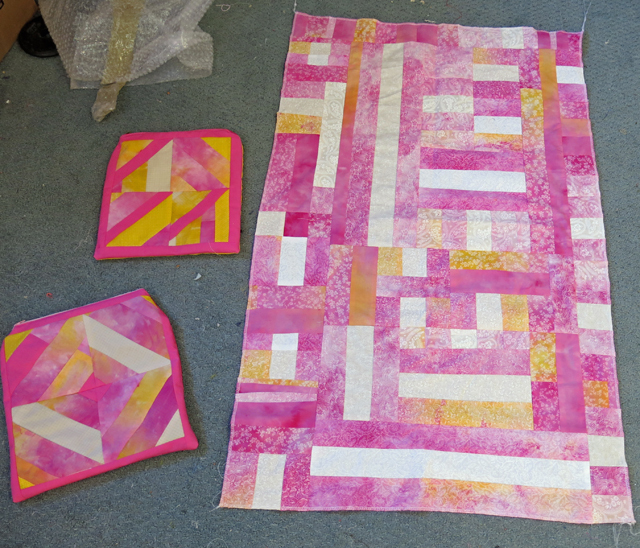 I am taking a break from sewing and dyeing for now. I am doing some serious spring cleaning this week! Spring has finally arrived. 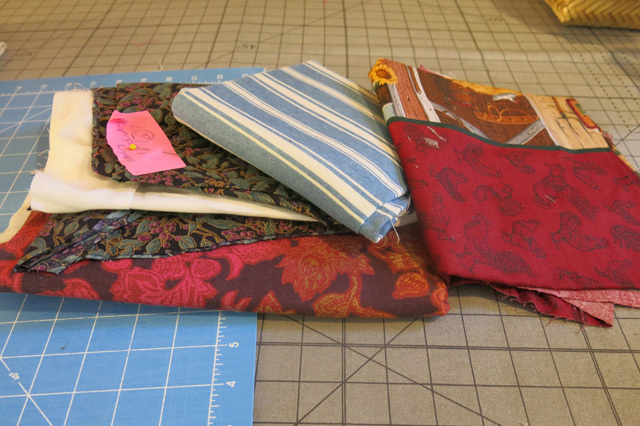 The next sewing projects on the table will be some fun skirts. 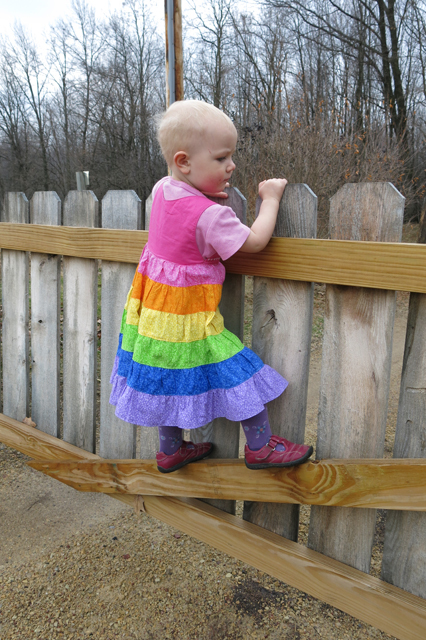 Then I had this great idea…buy a bunch of rainbow fabric with a debit card that I won from the bucket raffles at my cousin’s cancer benefit. My cousin has a nine-year old daughter who was getting an American Doll and would probably like matching skirts with her new doll. All my life I have said, “I would never make doll clothes!” Well, when a sweet little girl is getting an expensive doll, as her last b-day gift from her daddy, I thought she needed matching skirts! I searched many sites for ideas and patterns. I found a few patterns that helped me come up with my design. I got the measurements from my cousin’s wife and went to work. The doll skirt was first, because if I made a mistake it would be a small mistake. 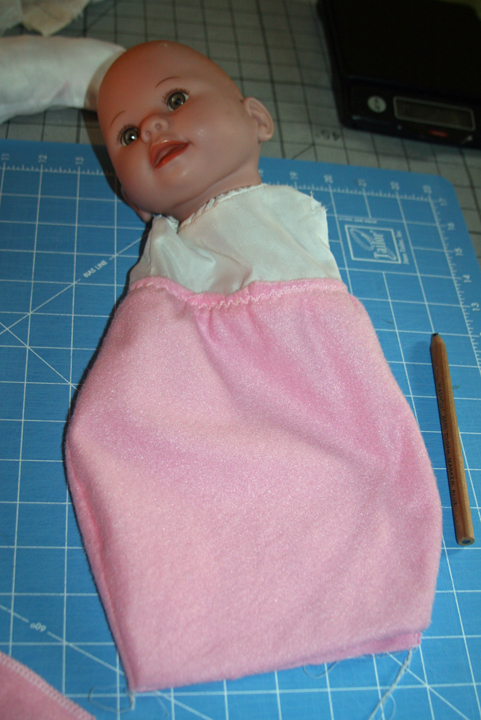 I learned a bunch of things while making the doll’s skirt and made the skirt for Ashlee with no mistakes. Ruffles are a lot of fun to make! 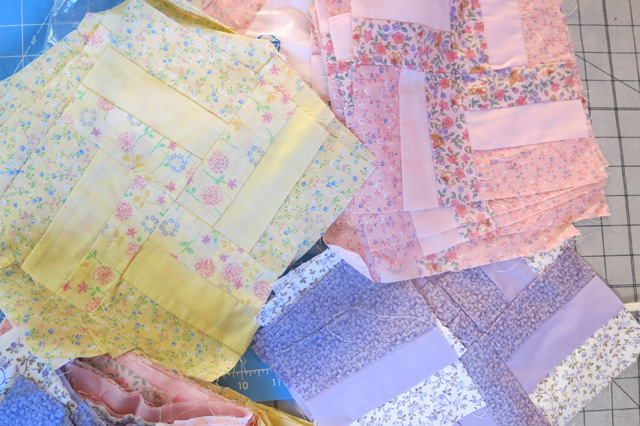 After finishing Nola Mae’s dress I started to look at my fabric stash and started imagining ruffled skirts. 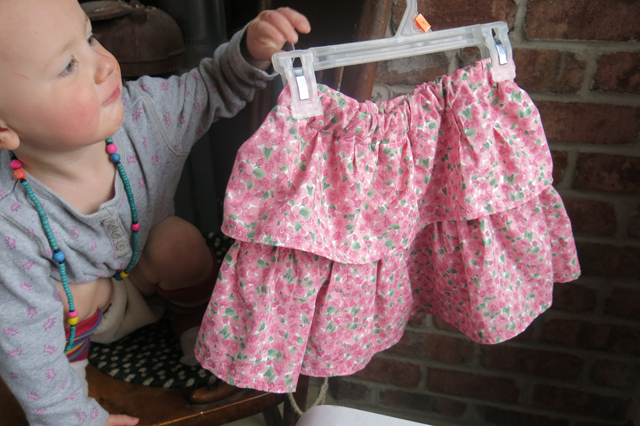 I needed to leave my sewing room because I only have one daughter who would look pretty cute in a ruffled skirt every day of the week and remembered I don’t get much time for sewing because there are other things that need to get done around the house. group, my friends, and my family, I succeeded. Robbie and I made it last until he was 16 months old. Nola Mae and I are still going strong at 17 months. You can read Robbie’s story here and Nola Mae’s story here. 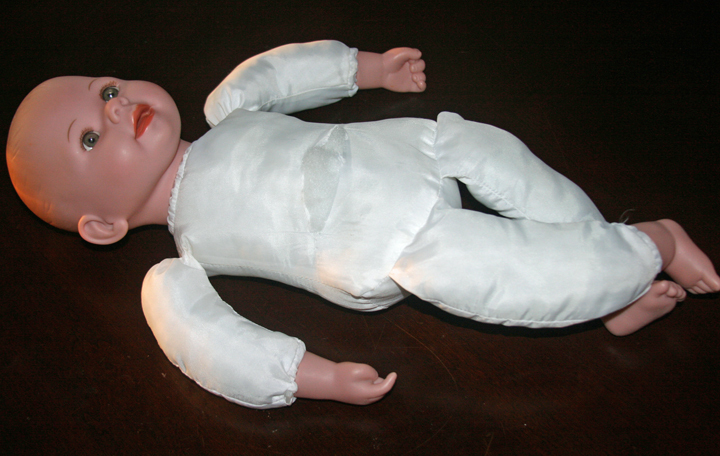 What does this have to do with a baby doll? I was at one of Sandy’s baby groups, the topic was baby wearing. 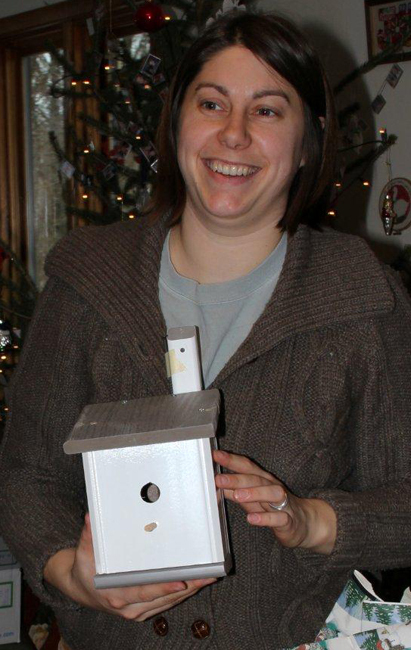 A friend of mine was teaching/demonstrating with a doll weighted with bee bees so the doll was more real to life. Sandy thought that kind of baby would be helpful to her when she is teaching the breastfeeding class and childbirth class at Riverside Medical, demonstrating baby wearing and while working with moms/dads; she can show things while the mom/dad holds their baby. I told her I could try to figure out how to make one of those babies for her. Now I can do something to help Sandy and other future breastfeeding mothers! I am the queen of cheapness! I try to make Do It Yourself (DIY) things all the time! Why not with this project? I was searching rummage sales, Goodwill and St. Vinnie’s stores for many months. 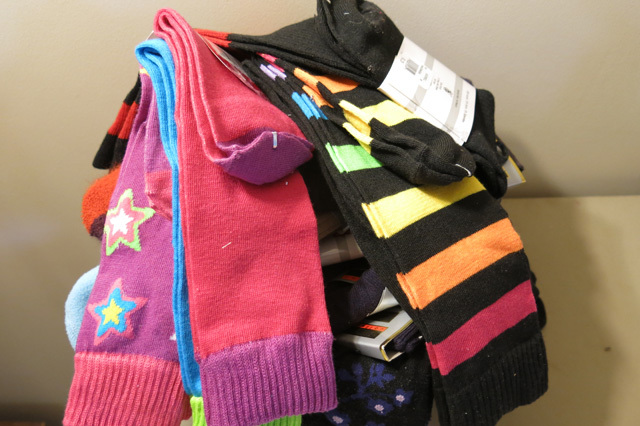 In August I hit the jack-pot at St. Vinnie’s in Marshfield with their “50% off sale”. I completed this project by only spending $1.25, the baby has “2.50” marked on the left foot. 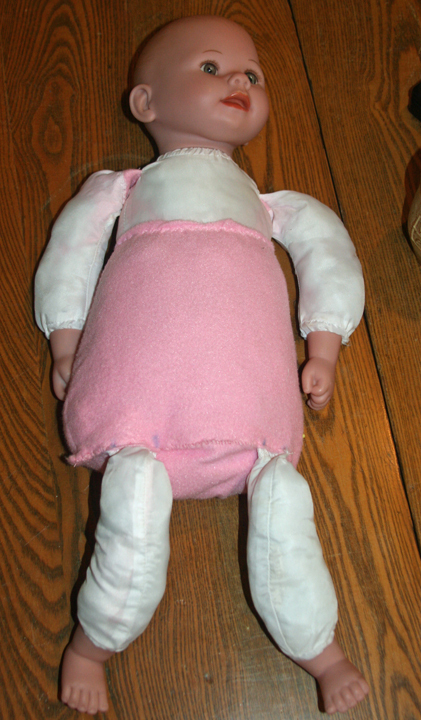 I started with this baby doll, cut open the body to see how things looked on the inside. Next time I will open the seams where the legs are attached to the body. 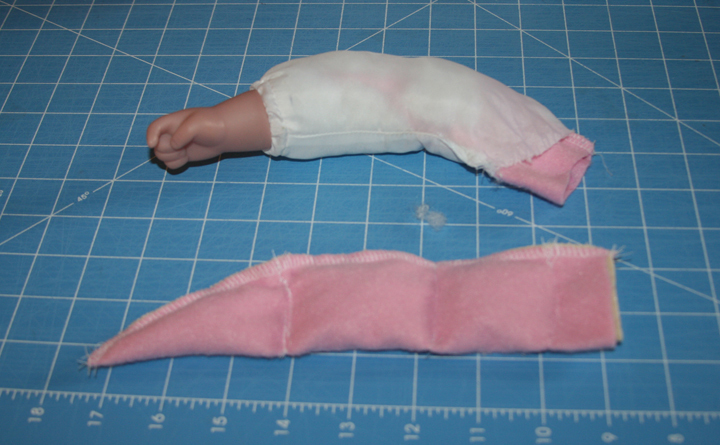 I cut the seams that were holding the arms and legs on. And needed to make the body a little bigger to hold the insides. The pink fabric was given to me. I gathered rocks for the head. I put them in a sack so they wouldn’t bang around inside the head. Next time I will put more weight in the head. 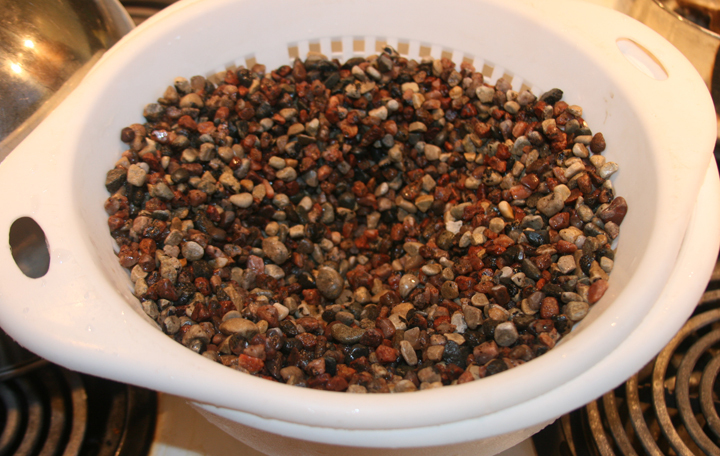 I gathered pea gravel, washed and rinsed it. 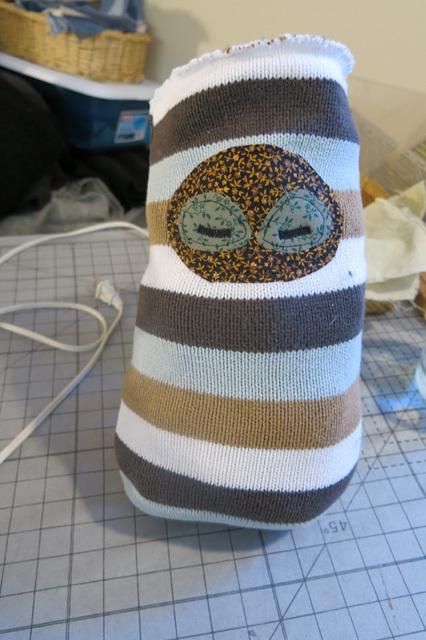 I made pouches for the arms and legs to have sections full of rocks, with stuffing added to soften and round out the arms and legs. Arms weigh about 3.5 ounces each. Next time I will make the arms heavier. 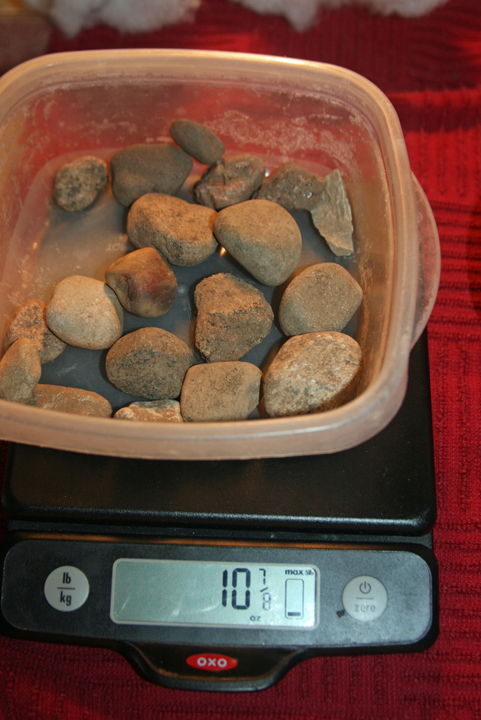 The legs are about 5 ounces each. Next time I will make the legs heavier. A pouch for the body cavity weighs four pounds. All the parts here are ready for me to put the baby back together. 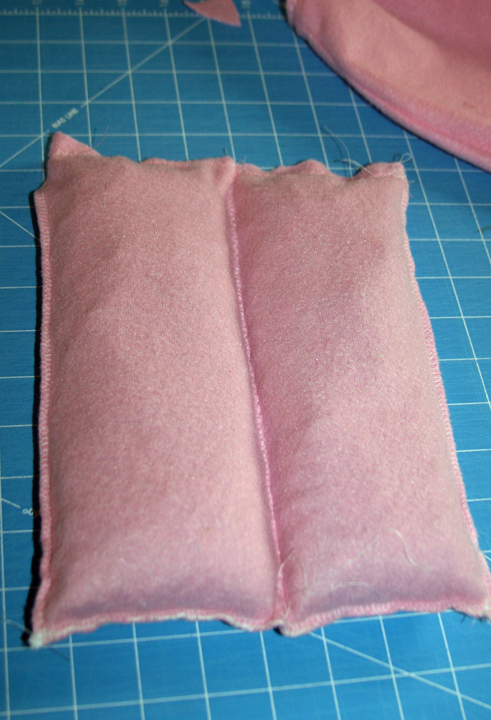 I made a second sack for the body and stuffed the stuffing in to soften the body. 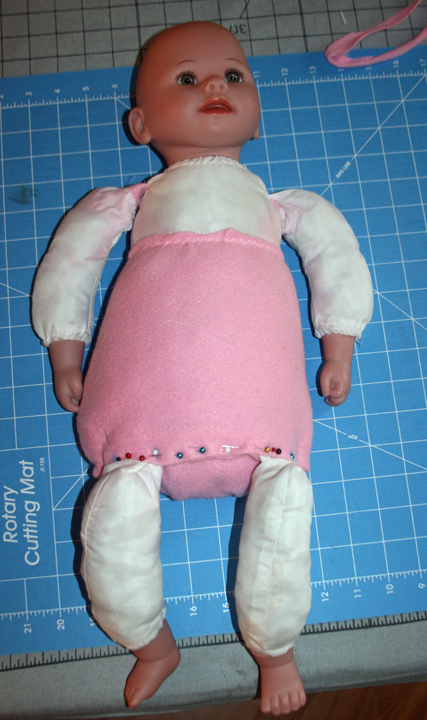 At this point I was hoping clothes or a sleeper on this baby doll will make the shoulders and attached limbs look more real. I was unable to sew the last seam with my sewing machine. Nola Mae wanted to sit on my lap while I sewed. Many times she kissed the baby’s foot. 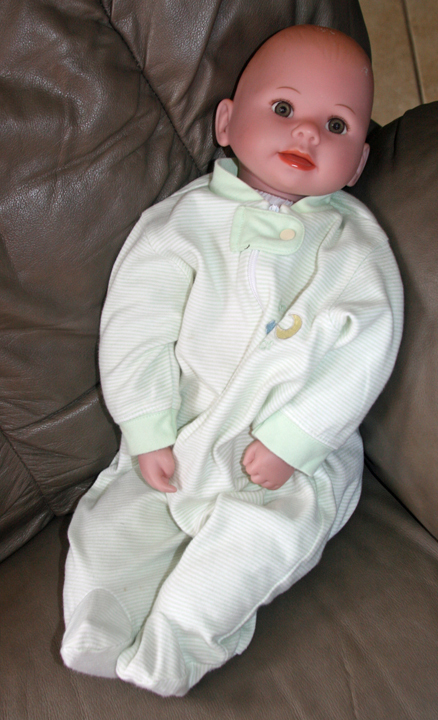 This baby is looking pretty real and feels real, not the eight pound baby I was hoping for. The final weight is 6 pounds 5 ounces. I had the baby on the chair for the above photo. Nola Mae climbed up for some cuddling. This makes me think she has to have her own weighted baby doll. 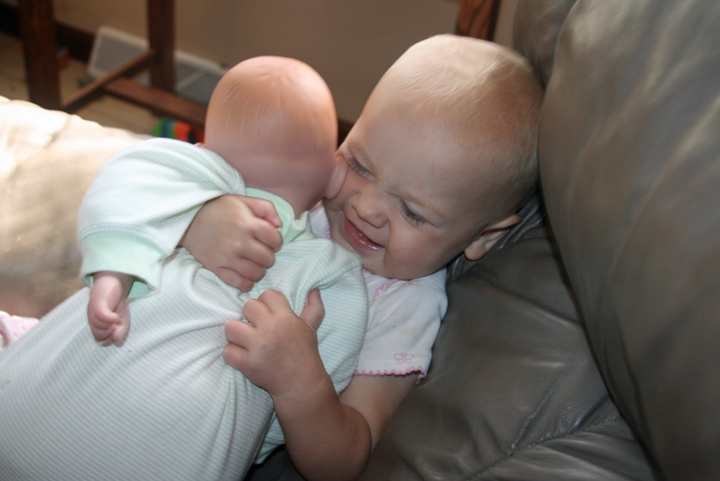 After the big squeeze, she started to pat the baby on the back. 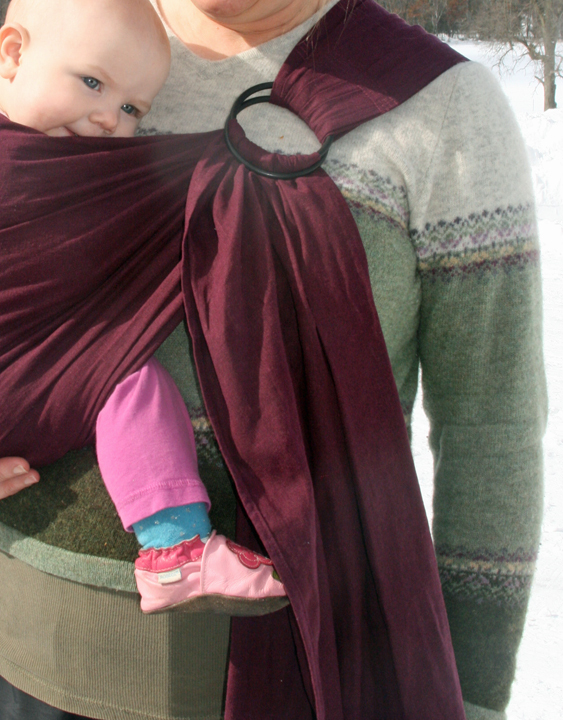 baby wearing in the Mei Tai. After this baby doll was finished I went to my sewing room to clean up a little, I looked outside my window and saw Henry carrying the baby down the driveway to meet the bus. I have been inspired by a few people to do some upcycle sewing. My step-mom, Lynn, showed me a bunch of wool sweaters that she felted and talked about the things she was going to make with them. 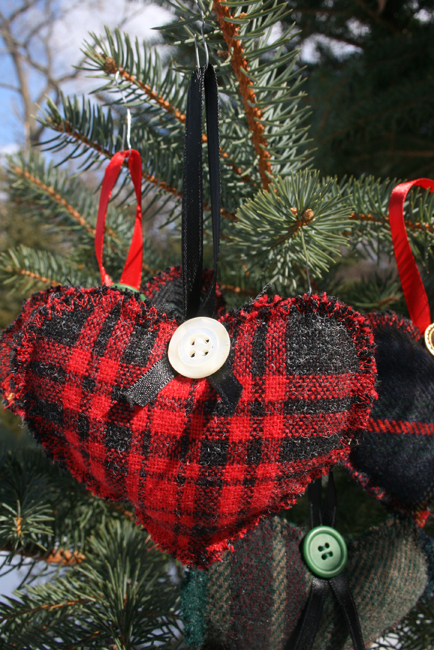 I went home and started googling things like upcycling sweaters, felting sweaters and found tons of cool ideas in many different areas. My favorite find was pallets for the garden. I was also inspired by the Vaters at Christmas time. 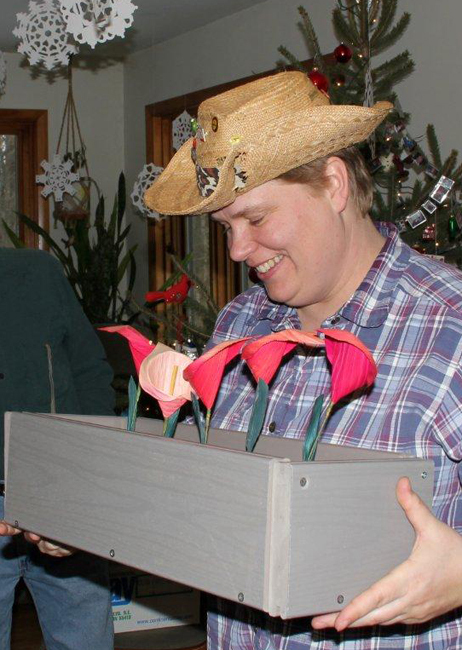 Our art exchange theme was “container” and there were a few upcycled items – deck material made into a bird house and also a planter, a feed sack made into a tote bag and a watercolor painted container made from an oatmeal box. 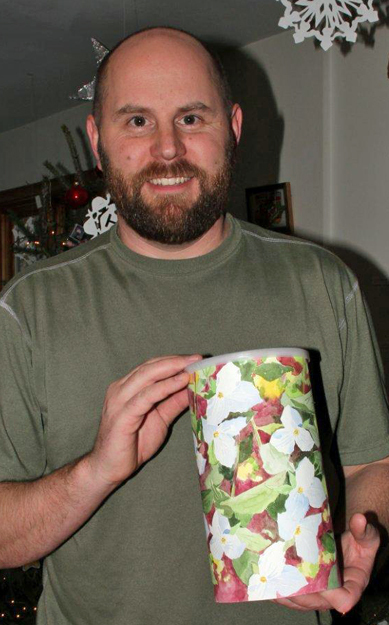 Those ideas lead our family to decide to agree on a “upcycle” theme for our 2013 art exchange. My other inspirations came from Prudent Baby, a blog I follow. 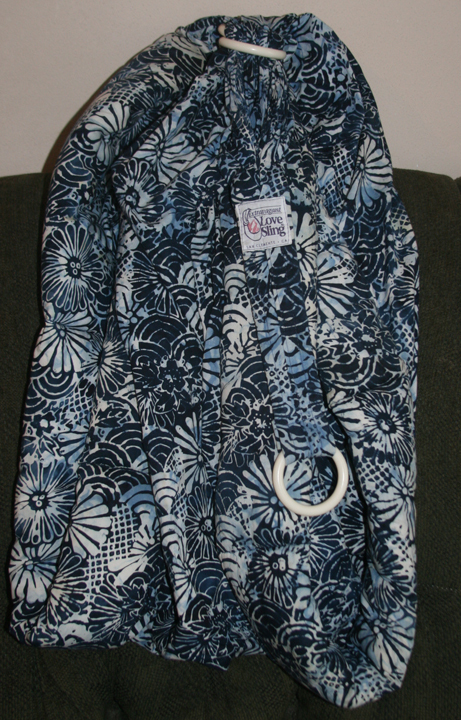 I had this older style ring sling that I never used before because I couldn’t get it to work for me. The reason was that the design and baby position is unsafe and wrong! For some reason I was saving it. 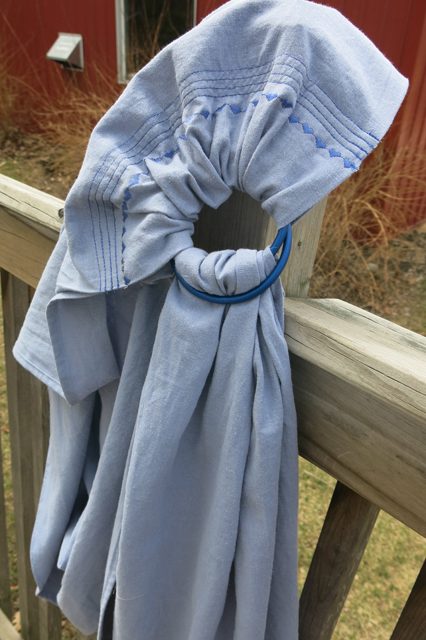 When I needed a pair of ring slings for a kid’s sling I cut this baby apart. I still have the fabric and may find something to make out of it. I bought this sweater at Goodwill with the intention of making baby legs out of it. 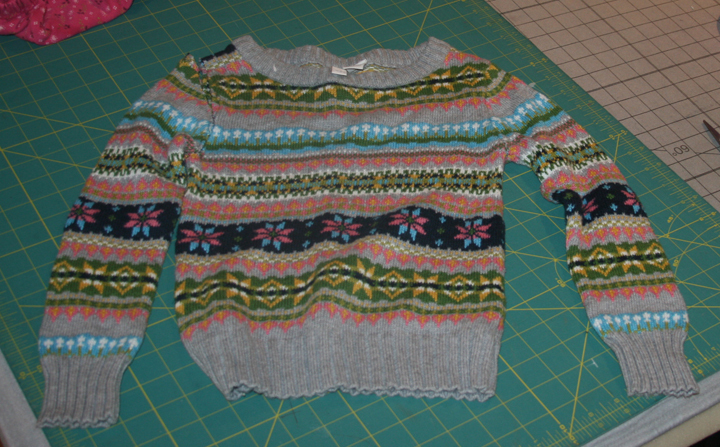 The pattern was so cute on the sweater that I had to use the whole thing. Another shirt I found at Goodwill. I wanted to try to make pants out of the legs for Nola Mae. 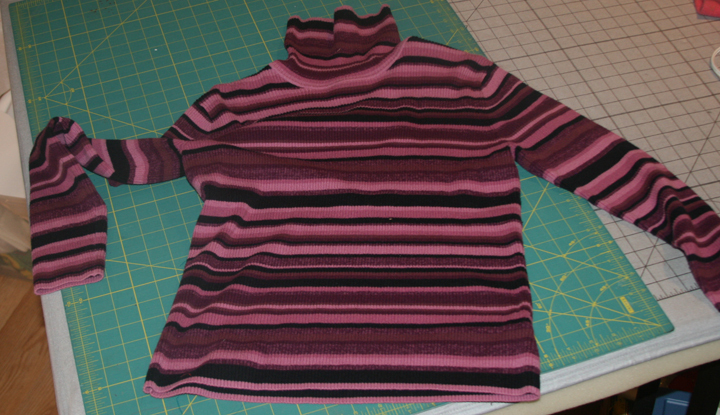 After inspecting the collar and sewing the collar inward, the neckline would fit Nola Mae. Which was perfect, I am not sure how I would alter a collar. 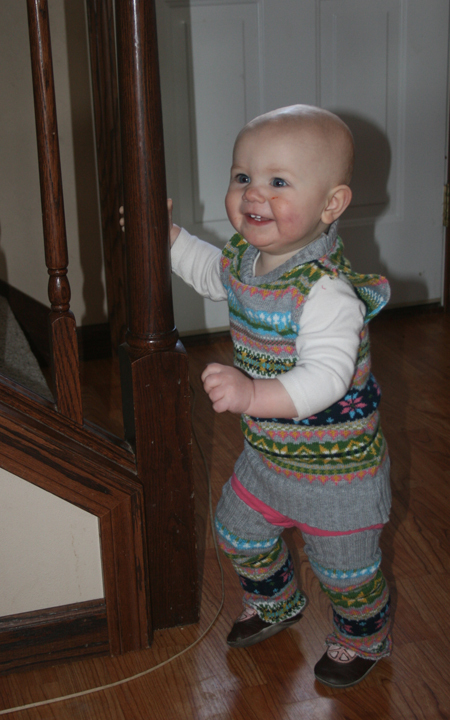 These pants turned out very easy to make and they look and seem comfortable to her. I wish I could have a pair of my own. I found this awesome wool sweater early this winter at my favorite thrift store in Marion for $1! My intention was to felt it and make some soft toy for Nola Mae. I tried it on before felting and it fit me. I wore it for skiing almost every day. I always washed it in a cold and gentle cycle and laid it flat to dry. The sweater slowly got smaller, you can see how much my tank top is showing at my waist. Once skiing was over I felted it. 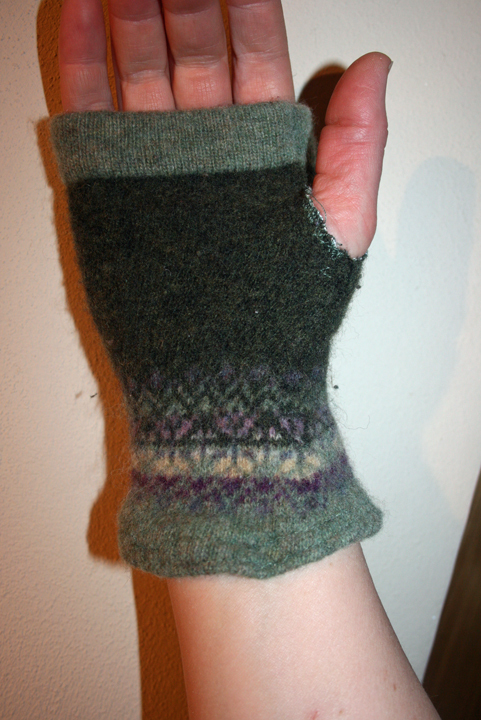 Last week I chopped the arm up and made these fingerless gloves. A friend posted on Facebook that she had some wool clothing that would be good for a repurposing project. I jumped on it without knowing what they looked like. I wasn’t sure what I would do with them. At the time these things arrived at my house I had started to search for Christmas ornament ideas. 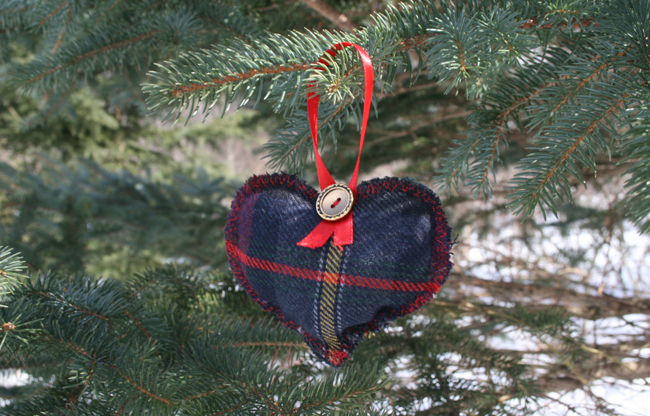 I made some heart-shaped ornaments. 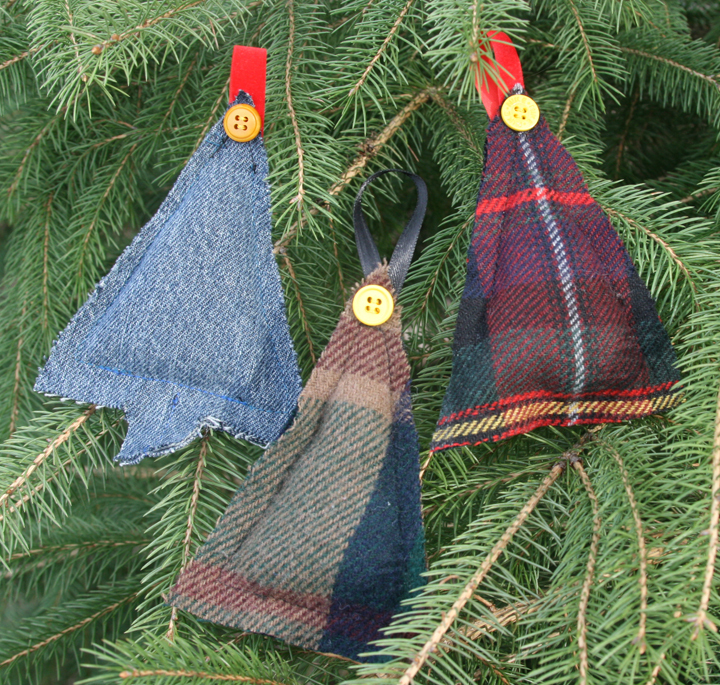 And Christmas tree shaped ornaments. 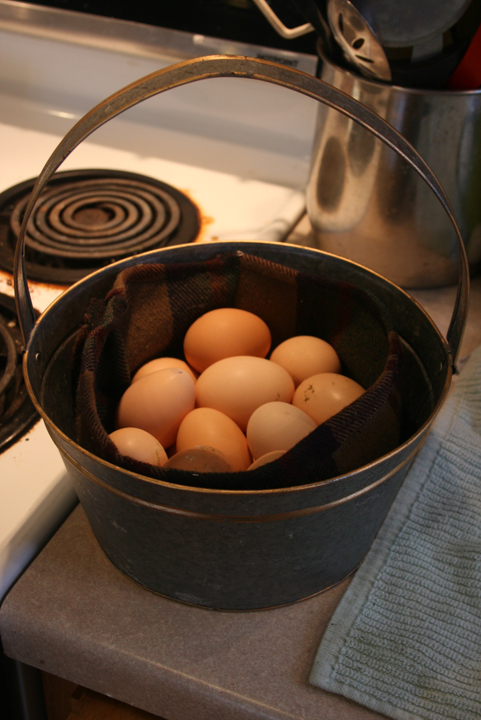 And a liner for my egg basket. Technically the only upcycled item in these photos is Robbie’s red cape. It was a curtain that I found at Goodwill. 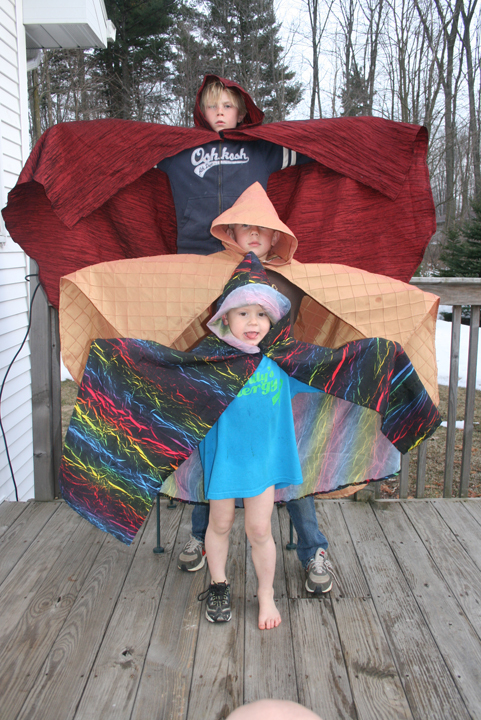 The other two boys’ capes were made out of fabric I bought at St. Vincent de Paul’s (my second favorite thrift store). 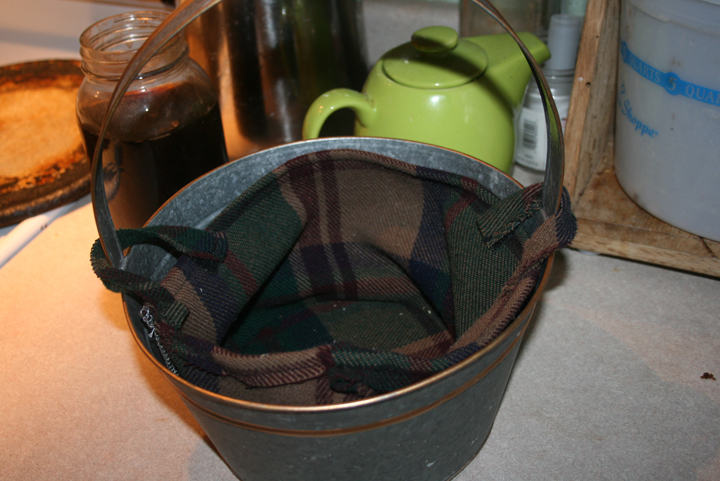 I have many other ideas for upcycling and hope to have a Part 2 post (maybe this summer). 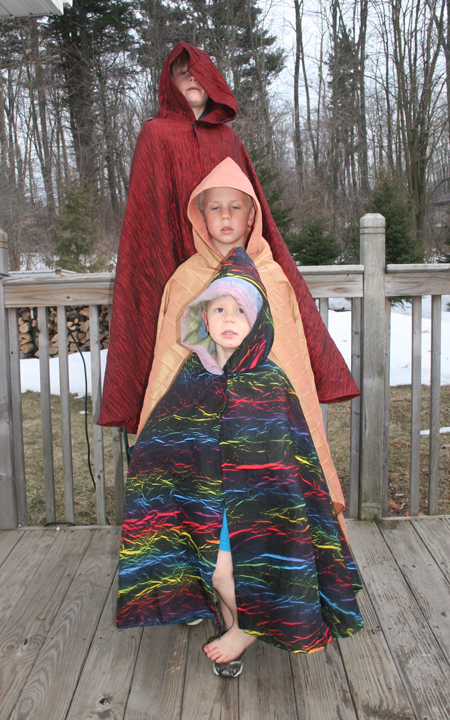 I needed to post this shortly after my Winter of Sewing (2013) because these things were also completed during the winter. 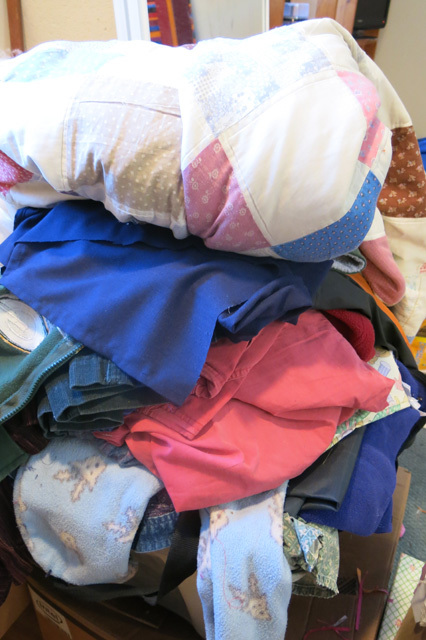 I took this photo on January 7, 2013 with the intention of sewing everything in this pile that week, documenting it and doing a blog post called something like a “Week of Sewing.” That didn’t happen so it turned into a Winter of Sewing. 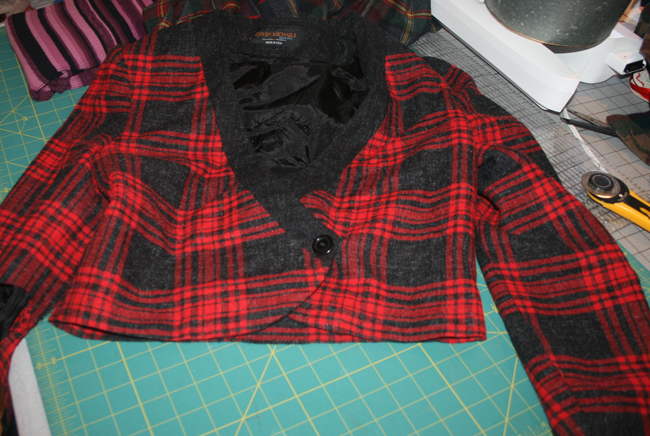 Black coat on the left – I replaced a zipper on a ski jumper’s coat. 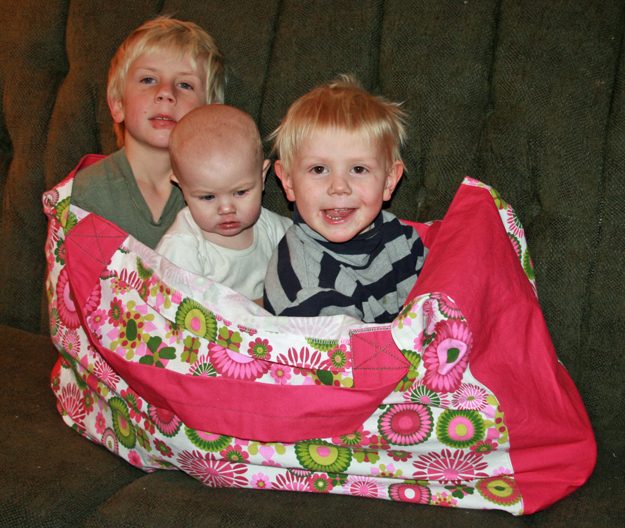 Pink fabric with flower print – a huge pool bag for my sister that fits three kids. 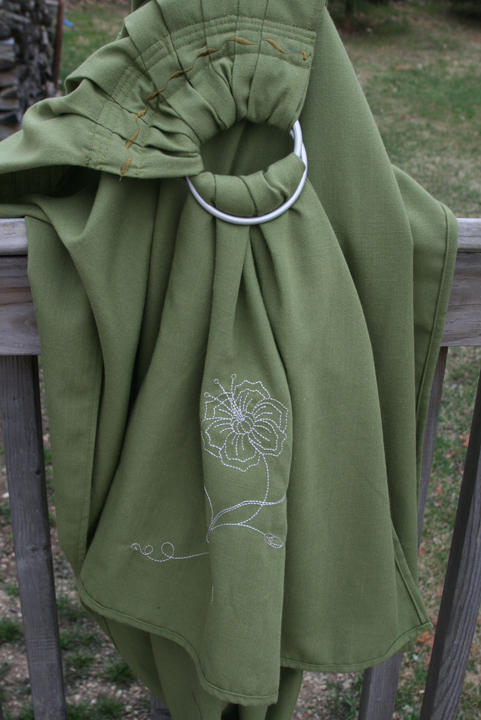 Green fabric with silver rings – a ring sling for my sister-in-law, BJ, and for a friend’s daughter. 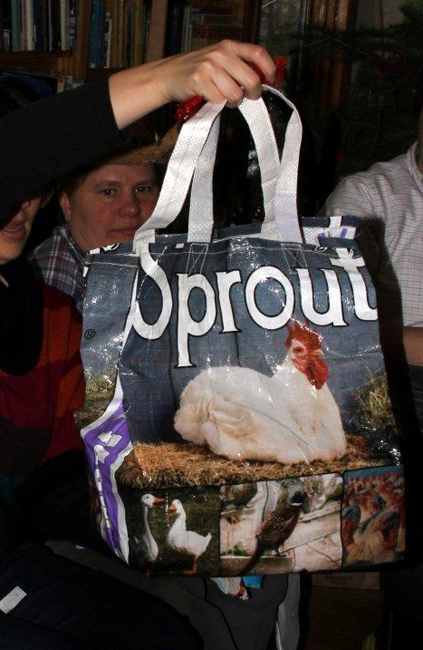 Extra fabric was made into bags for me and BJ. 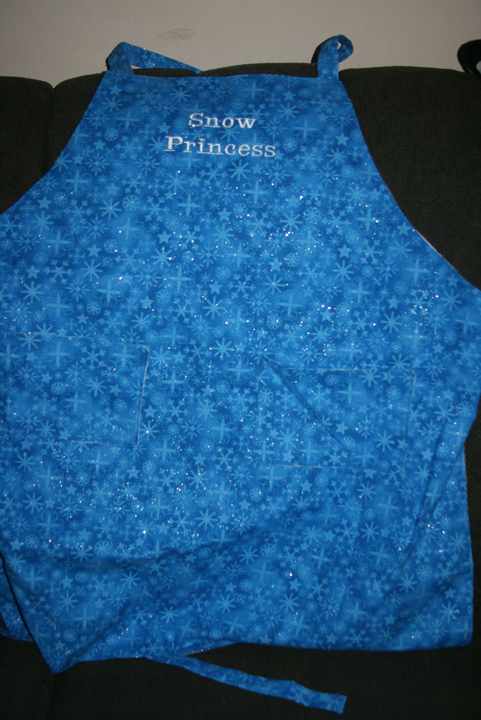 Blue fabric with snow flakes – an apron for a young lady who use to live and ski jump here. Not in the photo: a patch job on a friend’s coat. 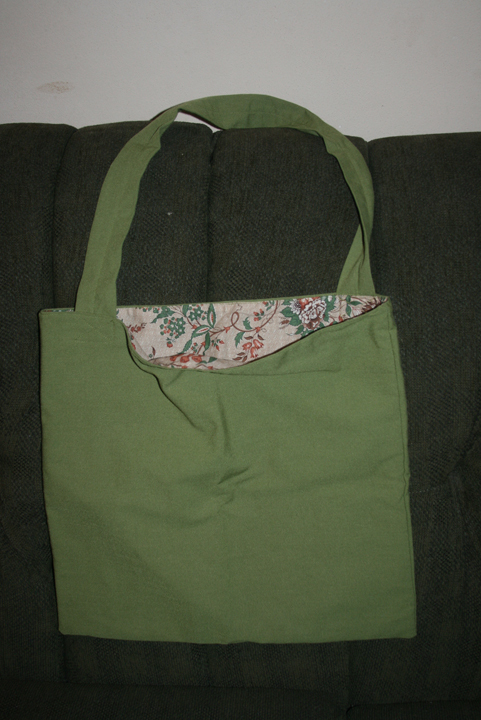 Top middle – old curtain from a thrift store to be made into a bag. 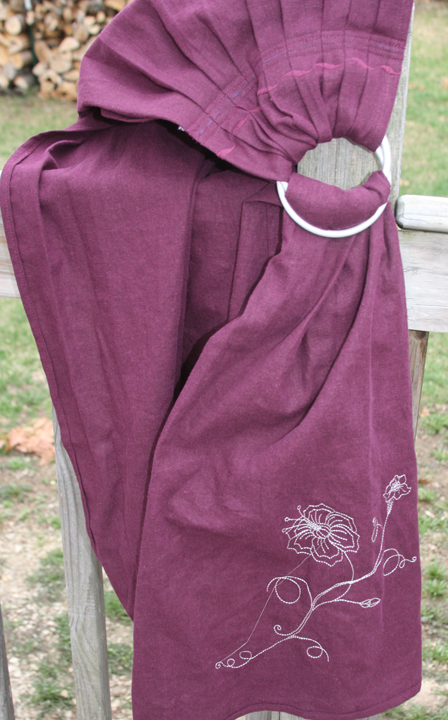 Purple fabric – maybe will become a skirt. 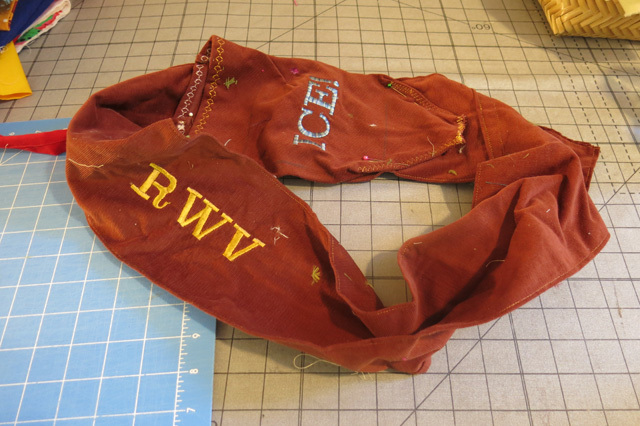 Brown fabric with “ICE” & “RWV” – a sword holder designed by Robbie to hold his wooden sword that he received at Christmas time. It has something to do with his Elemental Warrior game that he plays with his cousins. Green peppers print – will be a fabric box. 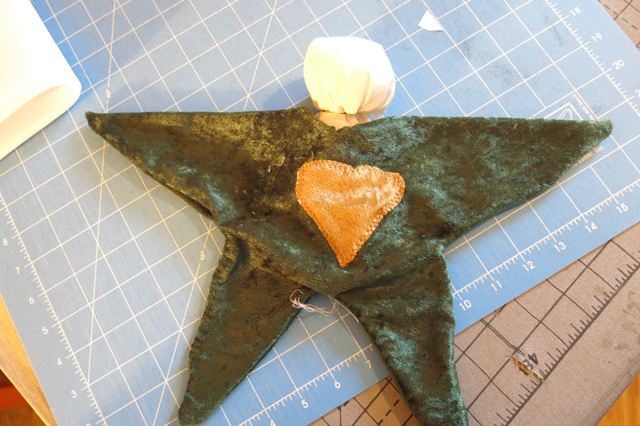 Green and gold fabric – will be made into a star baby or a couple of them. I am not sure exactly what happened that week. Could it be the many distractions from my four children, the need to cook and feed my family, laundry and very minimal house cleaning? Or maybe it was the skiing conditions were great that week and I went cross-country skiing. Priorities, right? My sewing will still be there but nobody knew how long the snow was going to last. I recently wrote a post on my cross-country skiing (Winter skiing 2013) because it was the best winter for cross-country skiing! 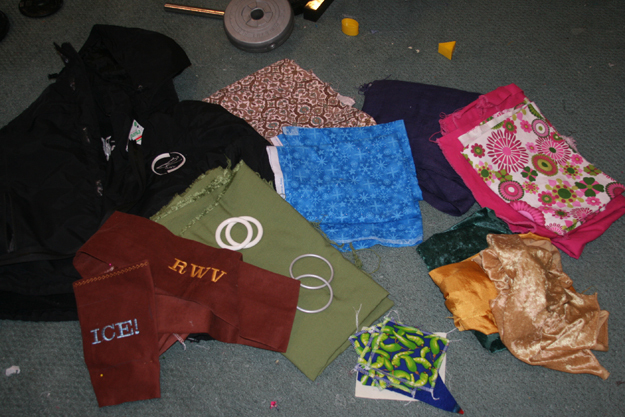 When I got into the mode of sewing and not thinking about skiing I was inspired or distracted, depending how you look at it, by other sewing projects that weren’t in this pile. 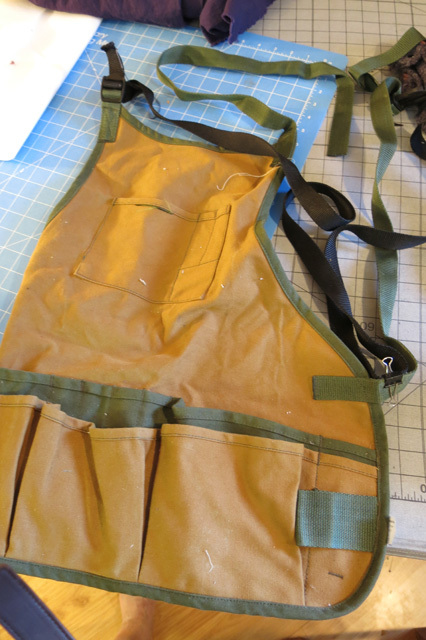 I hope to publish a “Upcycled Sewing” blog post soon. 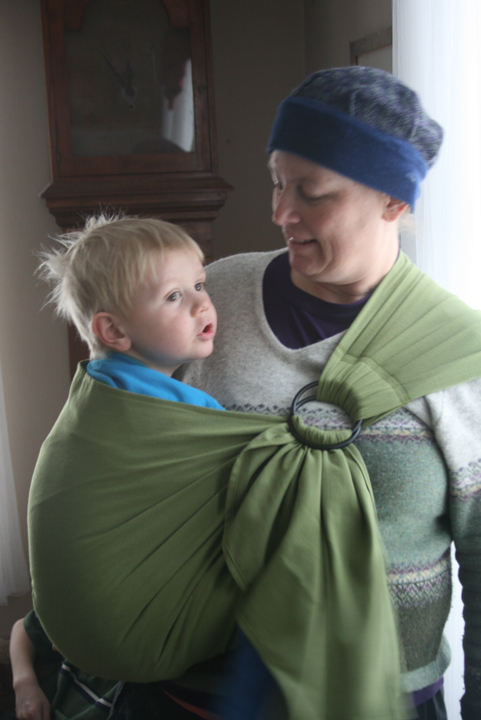 While I was making the ring sling for BJ, I thought Kale, my nephew, could use one too. I had this cool star print in my stash. 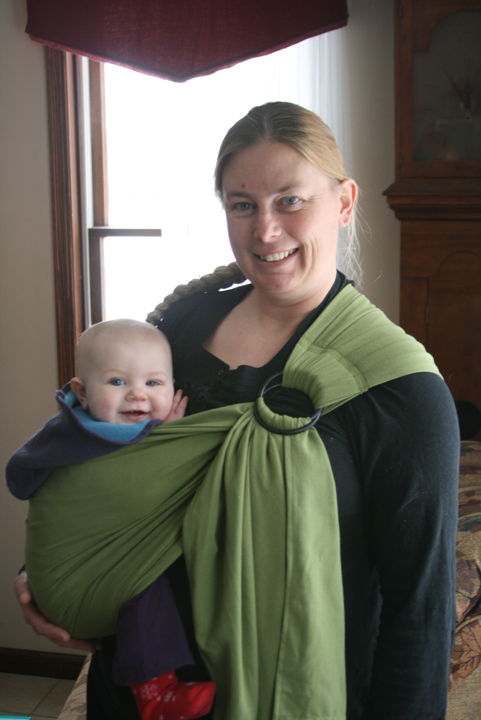 My friend, Kristin, saw Kale’s ring sling and asked me to make one for her three kids. 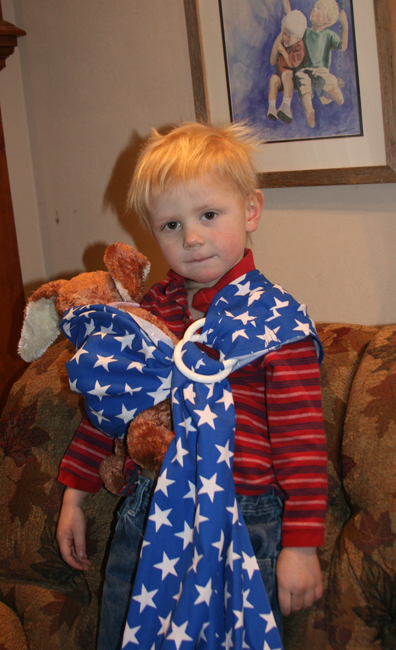 Henry modeling Kristin’s son’s ring sling. I used BJ’s ring sling for a couple of weeks and fell in love with it. 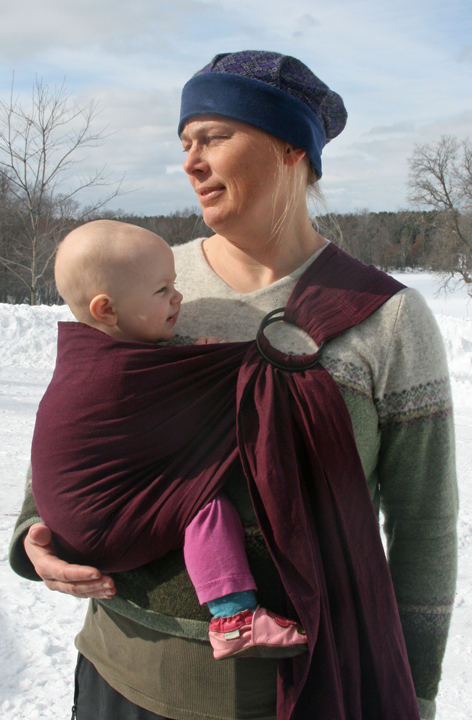 I never tried one and was never interested in ring slings. I always thought I needed to have both my hands free to do things and having a baby in a ring sling on my hip or on my front wouldn’t work, even if my hands were free. Except when you need to run into the store or school quickly while holding a 3 year old’s hand. 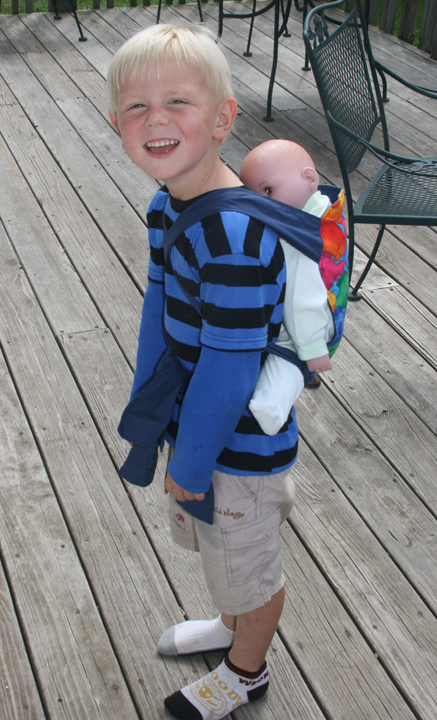 Or hold your baby while at a family function or event. Or when you are in a public place and need to nurse the baby to sleep and keep the baby sleeping. Too many uses to list. I took these to photos to show that ring sling can be used with a baby and a three-year old, separately of course. 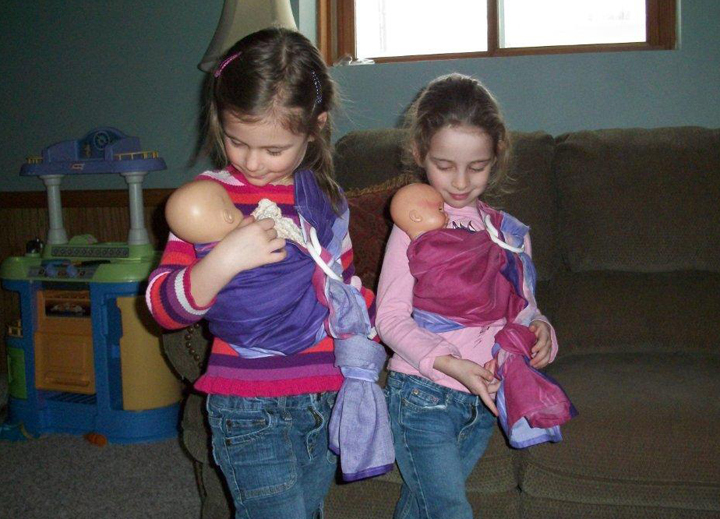 I have a friend who is a babywearing pro and has taught me everything I know. She has an instructional YouTube video on how to put a newborn into one of these ring slings properly. It is the best video out there! 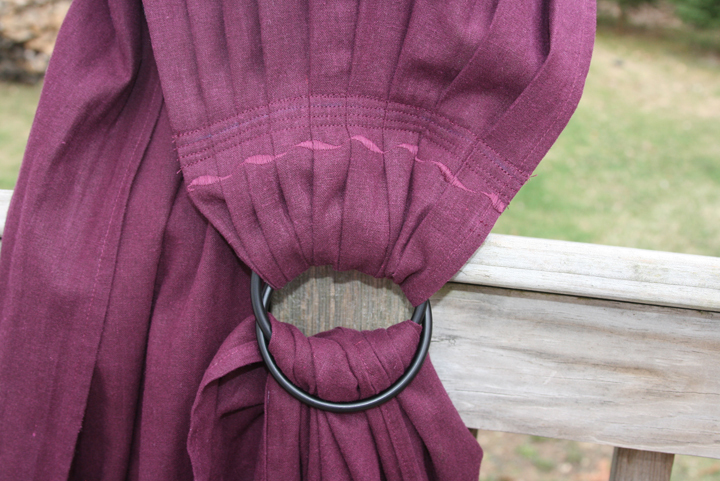 I went back to the fabric store and bought more of the green fabric and some of this plum color. I made this one with black rings for myself. I have been using a ring sling for three months and Nola Mae is slowly getting heavier. 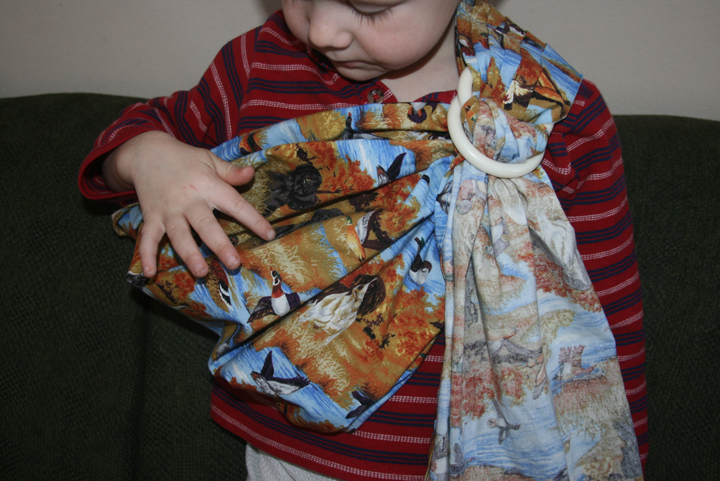 The ring sling has been comfortable for long periods of time, but lately not so much. I was having trouble with the shoulder riding up towards my neck. 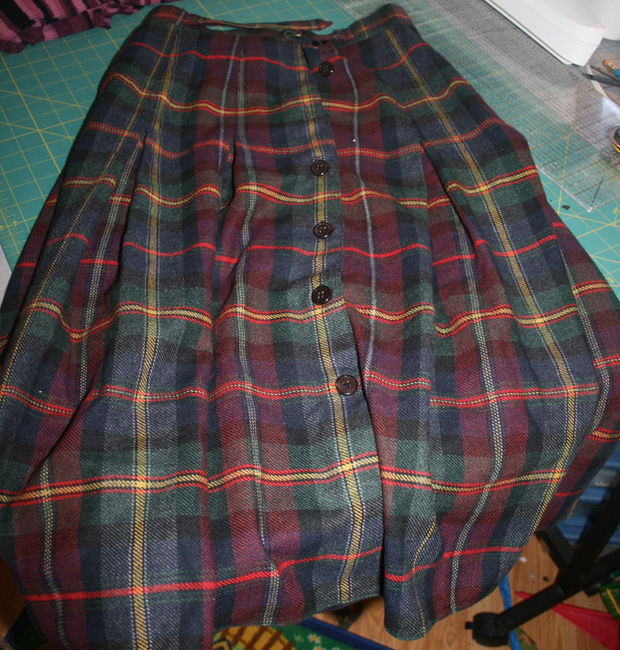 I believe that is because I made the pleats on the shoulder too narrow. 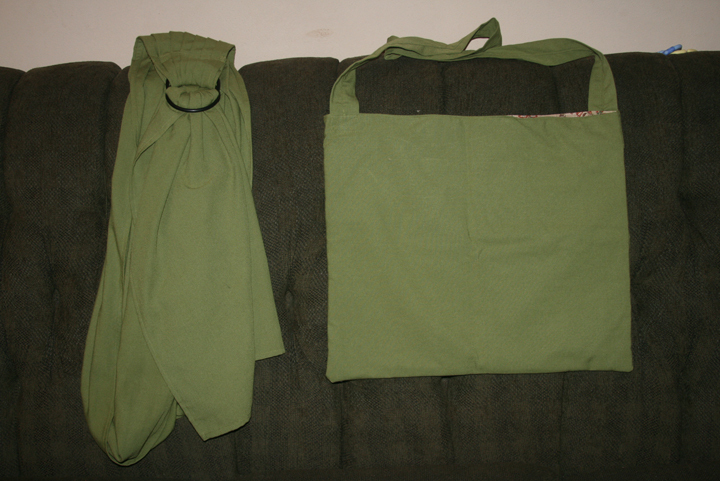 This week I finished making two more ring slings (another green one and a second plum-colored ring sling) and I ripped out the seams in the shoulder and widened the pleats on mine. Then I decided to add a pretty design to the tail. 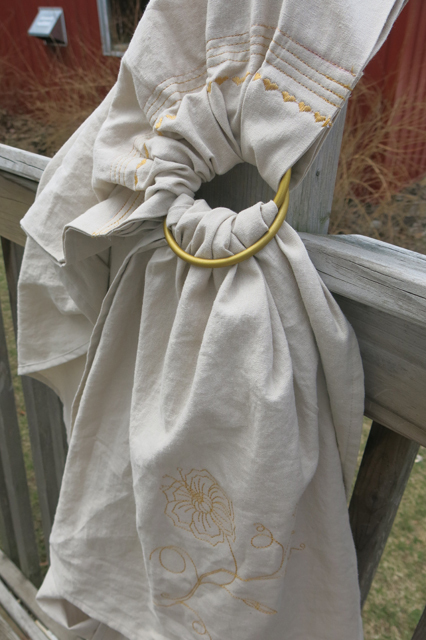 I made a seperate post for my upcycled sewing projects that I worked on this winter. I have been struggling trying to find a quilt design to make for our fourth baby. 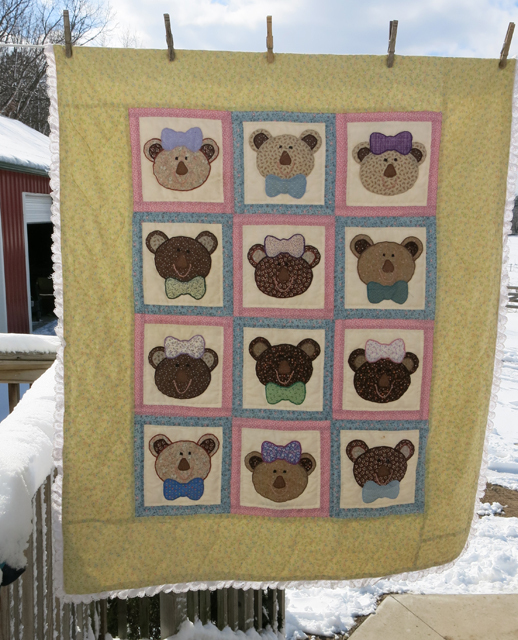 I liked the idea of using Bears as a theme for Charlie’s quilt and I found this one: Bears and bow ties in Playful Patchwork Projects . I started this before Charlie was born and completed by his second birthday. 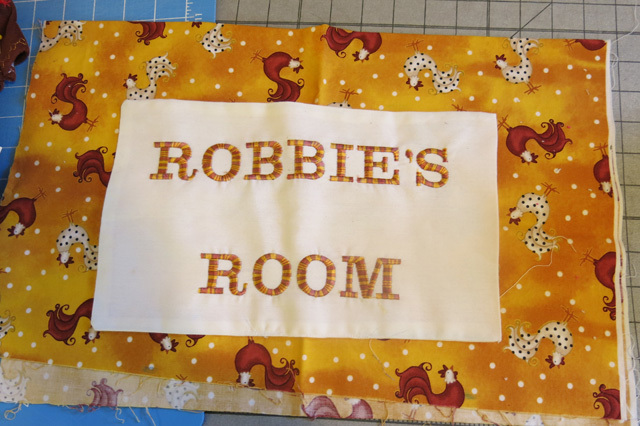 I loved the idea of using the same fabric as what was in Robbie’s. The ruffles were added instead of a binding because he always needed to hold onto the ruffles on my quilt when he nursed to sleep. Then we decided to have a third baby, Henry. I found another bear design. 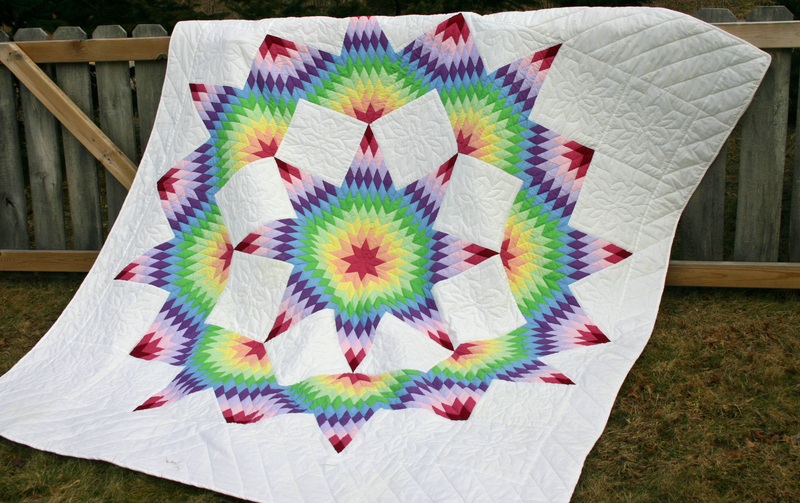 The original quilt design was made out of flannel in bright girly tie-dye colors. I wasn’t interested in that. Since I already knew that Henry was a boy. 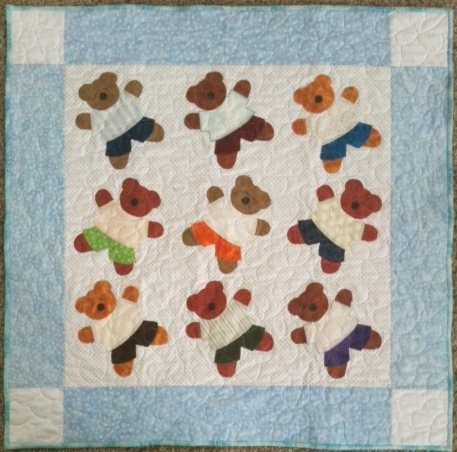 Henry’s quilt: Bears with huge hearts. I started Henry’s quilt when he was 1.5 years old and completed when he was 2.5 years old. 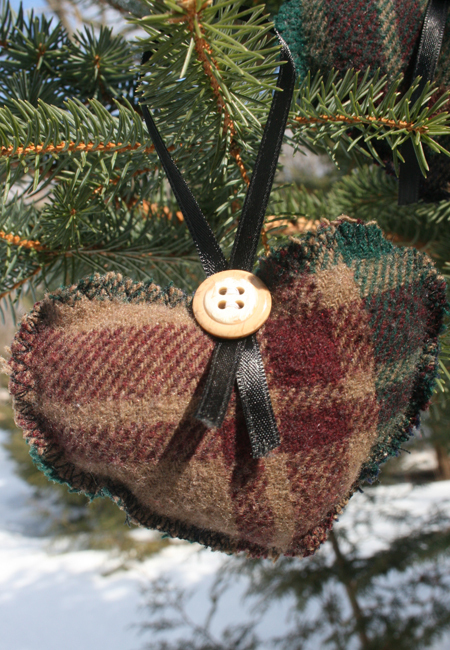 My idea was to put fabric prints in the heart spot of the things he loves. 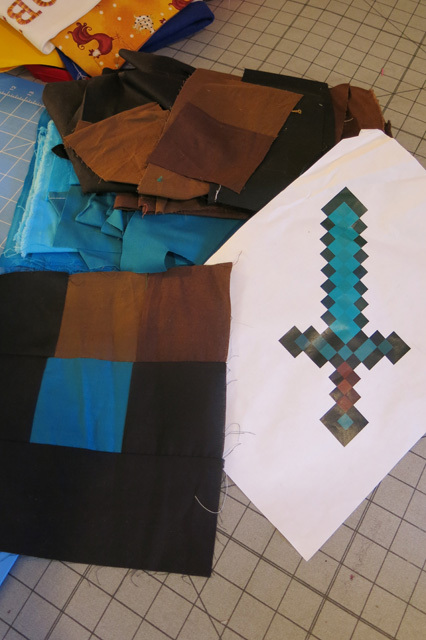 I ran out of the pink, blue and yellow fabrics used for the older boys’ quilts. 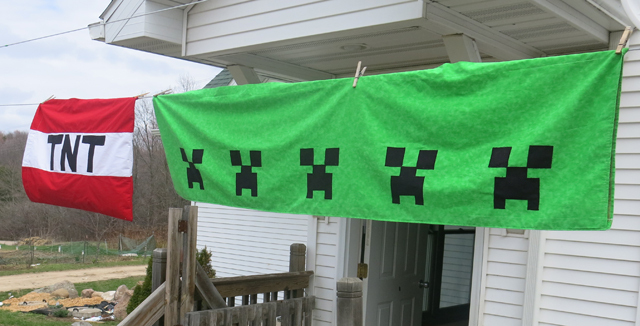 I hated making this quilt. Now we have a fourth baby on the way. I am having a difficult time figuring out what to do next. I don’t feel the need to follow the Bear theme. 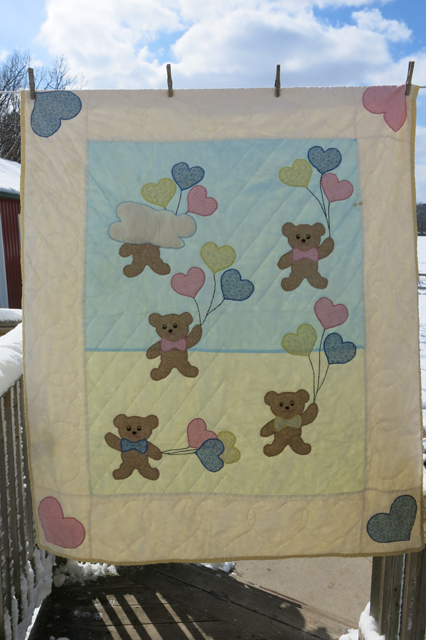 I would like to have a good start on this quilt before this baby arrives this spring. I have my doubts that I will have any time for sewing once we have four children! I recently shared some ideas in a past post. Now I think I am ready for a vote from my friends and family! 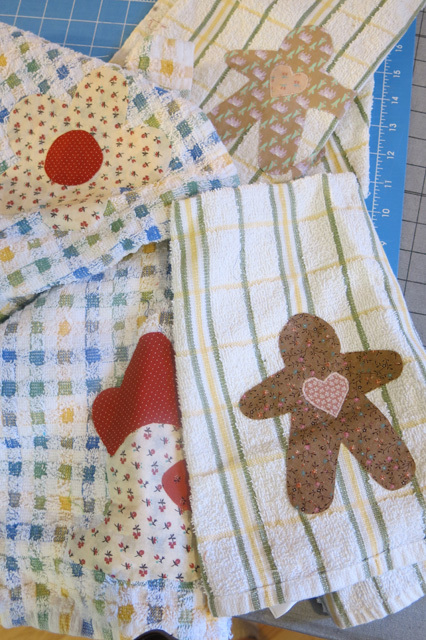 I have spent a few hours sewing strips together, ironing and cutting out squares. Now that I have it laid out I am not happy with how it is looking. It looks nothing like a baby quilt to me. I could see these squares made into bags or with more squares added it would be a nice lap quilt. I did have fun using up all these scraps! Until today I was ready to give up on this project. 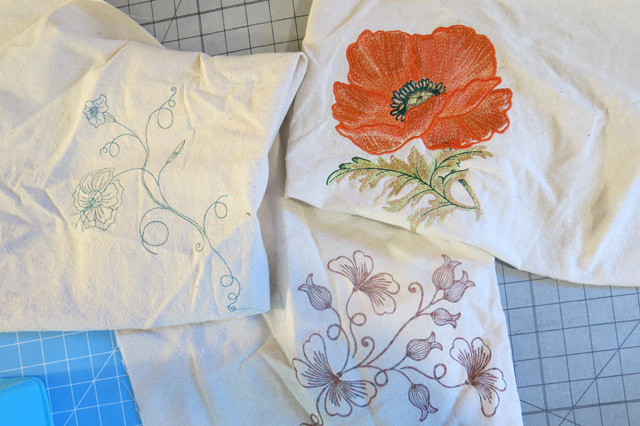 And sew like crazy on other fun things that I have been working on or want to make. Because if I have a girl I may want to make something really pretty with purple fabrics and if I have a boy I could make a definite “boy” quilt. When I was in college and struggling my mom told me that I could pick out any quilt design and she would make it for me as a graduation present. That was just the motivation I needed. I looked through all her quilting books and found a Broken Star pattern with solids and in rainbow like colors and loved it. After 18 years almost to the day I received my gift. I get teary-eyed every time I look at this quilt. I graduated from UW-Stout on December 18, 1993 and received my graduation quilt on December 17, 2011. As you can see it is beautiful! My mom did an amazing job. In 1993, my mom had three 5-year-old girls to take care of, farm chores to do and very little sewing and quilting was done during this time in her life. 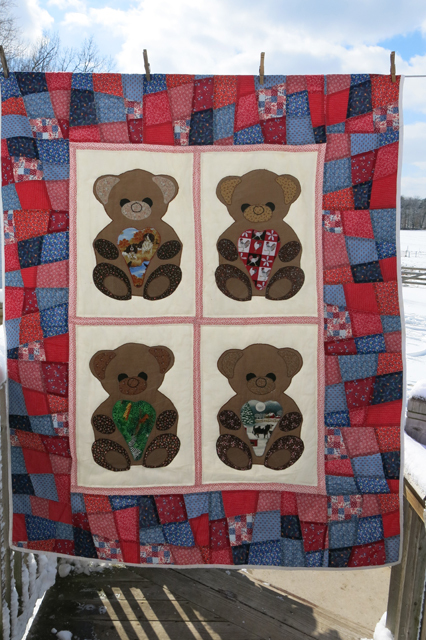 Once the triplets were older and she got back into sewing she has made many quilts and finished quilts that she started before the triplets. In the past couple years, since my triplet sisters have been in college, my mom has made some very beautiful quilts for others and I have forgotten about this quilt. 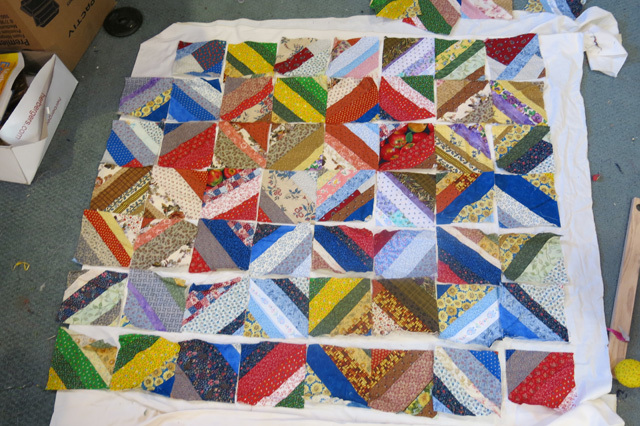 This Broken Star Quilt was very difficult to piece and I remember her telling me that she was struggling with it. I have always imagined us tackling this quilt together or that one day after she died I would find this unfinished quilt and have to finish it alone. “I had a little trouble finishing your graduation quilt on time. 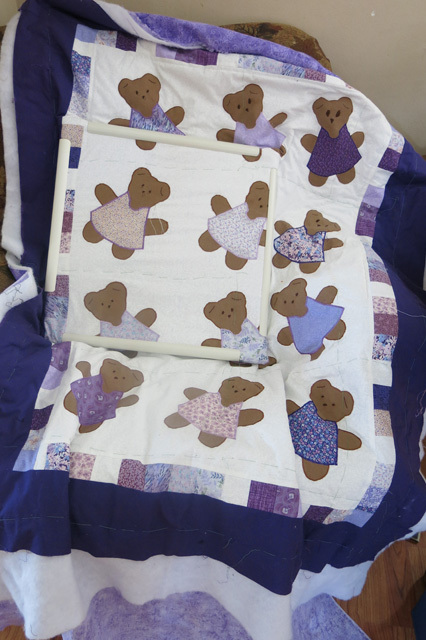 I didn’t get much quilting done for years after the triplets were born. 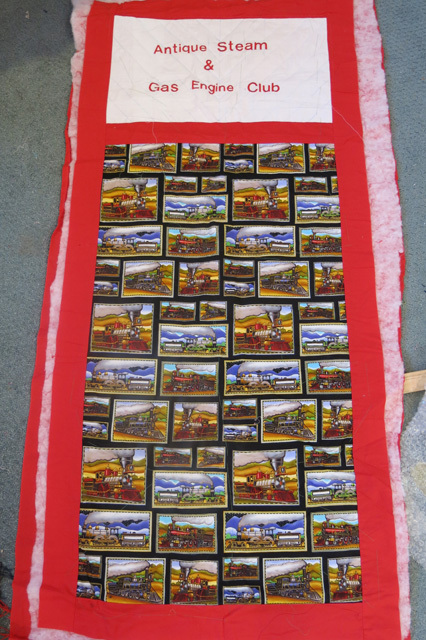 Once I did get back into making quilts, yours got put aside while I made others; even some for you. 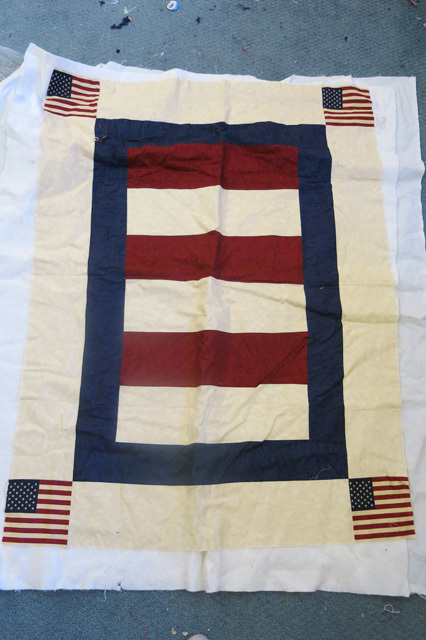 “In 2009, I joined the Curtiss Corners Quilt Club, and someone suggested a “Pizza Box” project for 2010. Each participant was to put a pattern, directions, and fabric in a pizza box. At the monthly meetings a person would take someone’s box home, make a block and return the box the next meeting. By January 2011 a person would have 12 completed blocks. “You know how I procrastinate. Well, the night before the meeting I still hadn’t decided on what I would put in my box. I thought an easy way to do this would be to put the fabric strips for the diamond in the box. I had 11 of the 32 diamonds completed. 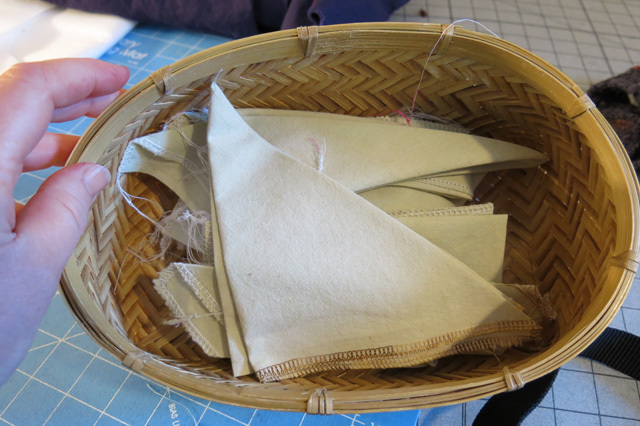 I put a finished diamond in the box as a sample for people to follow, and 12 baggies – each with the fabric for one diamond… I would only need to make 9 more. Thank you, Mom! It was worth the wait!!! I still have one child, Henry (2.5 years old), in cloth diapers and my fourth child arriving in the spring. I am getting nervous about the condition my mother-ease cloth diapers. They have been getting thinner and thinner by the year. 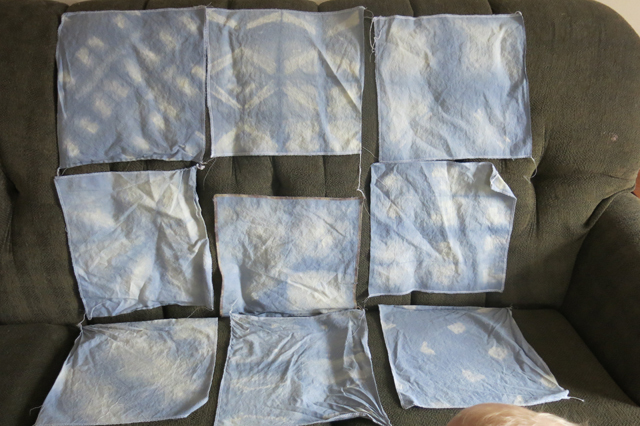 I am impressed with how these diapers have held up since they have been used on six children. Henry is the sixth child to wear some of these diapers. Before Henry’s 2nd birthday he was showing signs of interest to be potty trained and wanting to pee like his big brothers in the toilet and outside (a benefit to living in the country). He hasn’t made much progress in the last seven months. 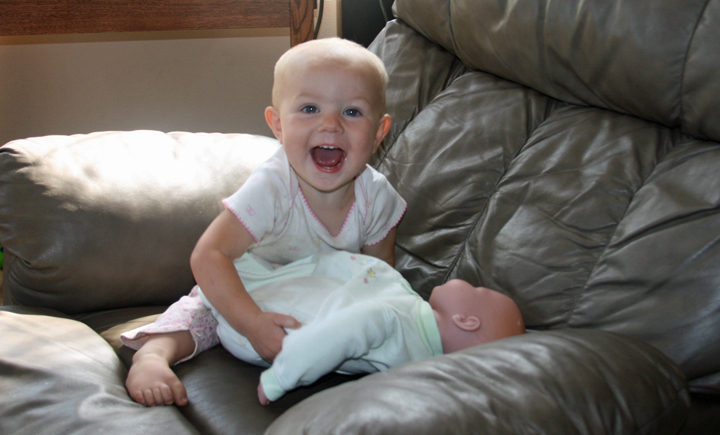 I was introduced to the mother-ease cloth diaper by a friend six or seven years ago. She wanted to sell some. I was tired of folding the flat-fold diapers I was using and wanted to give them a try. I actually never heard of any other kind of diaper than the flat-fold and pre-fold diapers that you use baby pins with, until I met this friend. I started out by purchasing 10 diapers from her. I loved them and when she was done with the rest of her diapers I bought more from her. 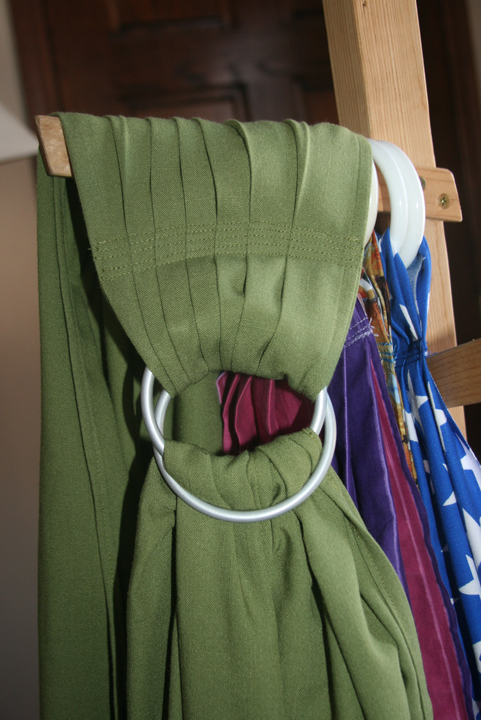 One of the many things I love about the mother-ease diapers is how awesome they are to hang on the line to dry. They don’t take up much space when snapped together. I hang dry them in the winter months to gvie my bedroom more moisture. Sadly, I have had to put some of the really thin mother-ease diapers away. No, I didn’t throw them away! I put them away in the basement and out in the open so I could see them and always think about what I could do with these awesome diapers. Something inside me wouldn’t let me throw the diapers away. They still had great snaps and the elastic was still good! A few months ago I decided that I could rebuild these diapers with the “good” parts. 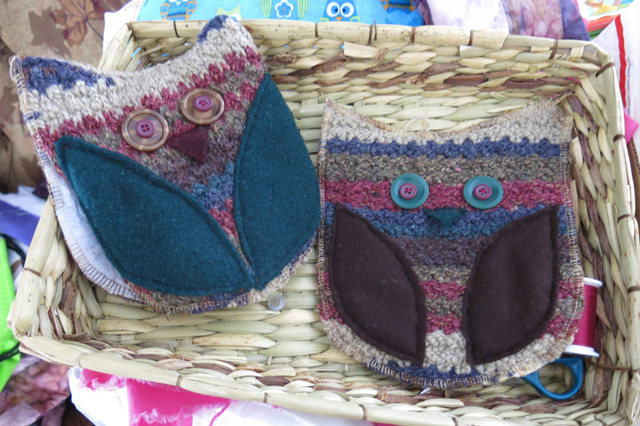 I consulted with a friend who does a lot of sewing and has made some of her own diapers. 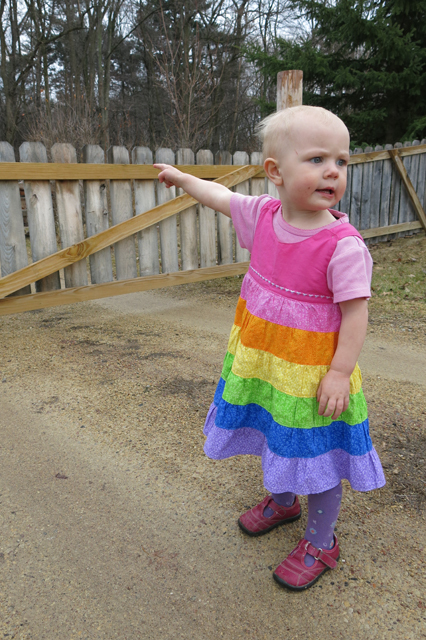 She helped me brainstorm some ideas on fabrics to use and how to get it done. 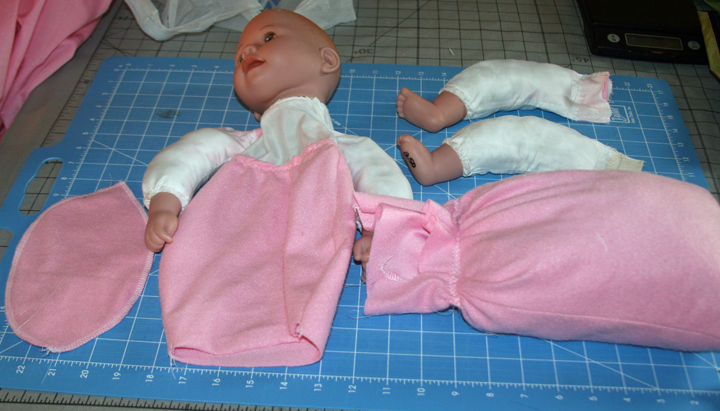 I purchased some terry cloth this week and started making liners and rebuilding my diapers. 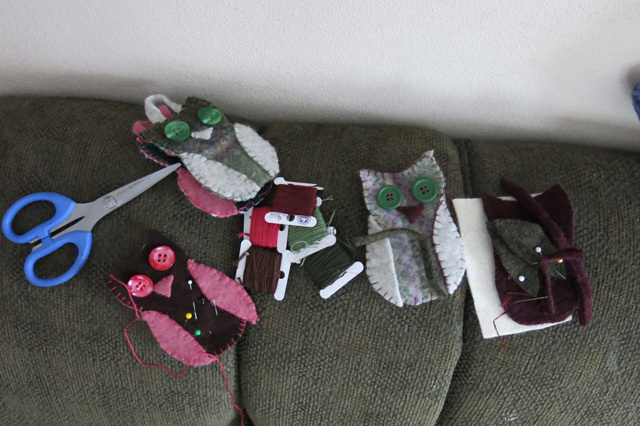 I only worked on a few and will put them to the test with Henry before I do more sewing. 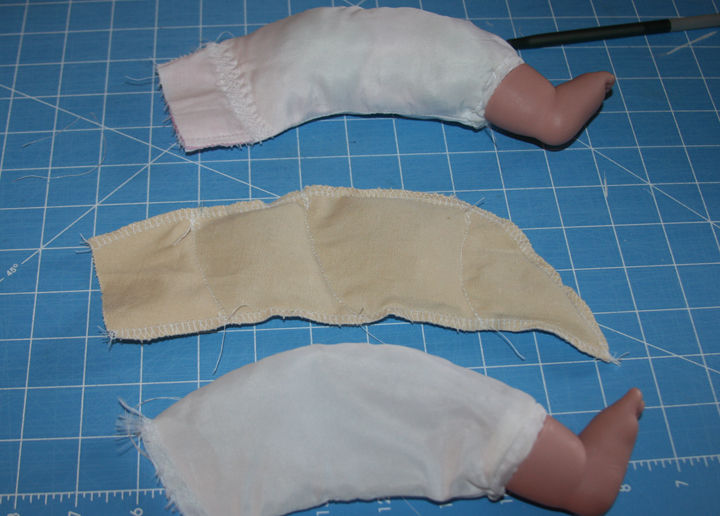 Another experiment was to add to the padding of the actual diaper with one layer of terry cloth and then add a second layer to the whole inside of the diaper. This method was very time-consuming. I am not sure I will attempt this one again. I was having trouble with my thread breaking. 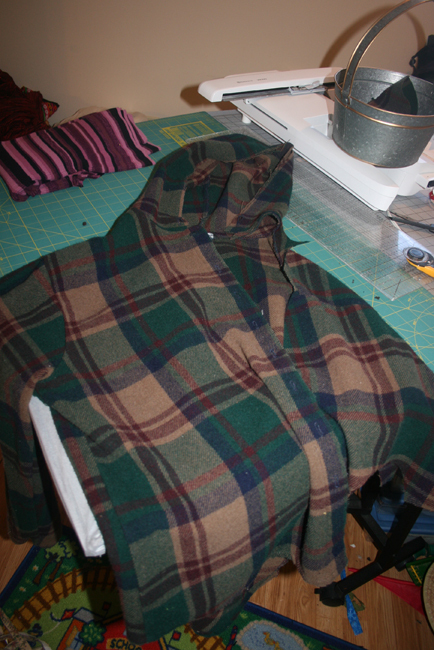 Maybe it was because of the multiple layers or a little of the stretching of the fabric I was doing? The test on this last diaper with the 3-layered liner was done last night. Henry didn’t soak the entire thing! As I post this Henry is wearing the diaper with just the new padded area and no liner. And going to the bathroom more often today! Maybe all this talk about making these diaper for the new baby is making him think more about saving diapers for the baby.